BRETT KANDT, with more than 20 years of legal experience serves as Special Deputy to the Nevada Attorney General where he provides leadership as a senior policy advisor on a number of issues facing Nevadans. His responsibilities include serving as Executive Director of the Nevada Prosecution Advisory Council, which develops and implements strategies for improving the enforcement of Nevada law. He also serves as Executive Director of the Technological Crime Advisory Board, which develops and implements strategies for a comprehensive coordinated response to tech crime, including identity theft and internet crimes against children. 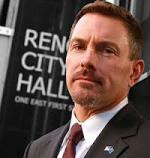 Currently Brett is a candidate for Reno City Attorney. BOTTOM LINE UP FRONT: Don’t be afraid to do something a little bit different. Think outside the box and see the world. Are you a MAC or PC and what brand of phone do you use? Owns and uses an iPhone, iPad and MAC but at work is only can use a PC. What is your favorite quote? “I think that, as life is action and passion, it is required of a man that he should share the passion and action of his time at peril of being judged not to have lived” by Oliver Wendell Holmes, Jr. (8 March 1841 – 6 March 1935) American jurist; Associate Justice of the Supreme Court of the United States from 1902 to 1932. What are your favorite books? Catch-22 is a satirical novel by the American author Joseph Heller, A Prayer for Owen Meany by American writer John Irving and favorite historianWilliam Manchester author of American Cesar and the Last Lion: Winston Spencer Churchill is a trilogy of biographies covering the life of Winston Churchill. LEISURE: .Love the outdoors, camping and backpacking; favorite thing is to go into Emerald Bay in the summer time at boaters camp.